Bandung is located in the cool highlands. Many people who visit this city just want to feel the cool atmosphere and see the beautiful view which is being presented. Bandung has many natural tourist attractions worth for visiting. Here are some of the natural attractions that are very popular among local and foreign tourists. The view of the lake and forest to the main attractions in this tourist area. This area is surrounded by trees of jamuju, eucalyptus, kitambang, riots, hamirung, kihujan, pairs, and Kurai. After entering the gate, you can stop by to deer captivity. You can see deer activity from the tower view. You also can feed the deer. travelers can also find a variety of different animals such as crows, doves, Javan deer, eagles, tigers, and monkeys. Once satisfied playing with the deer, the journey will continue to the garden of strawberry. Strawberry fields in Ranca Upas was very wide, you can hunt satisfied sweet strawberries all day. After having tired by playing in the garden strawberry, tourists can soak in hot water baths. You can enjoy the thrill of soaking in warm water that is trusted to make your body more refreshed. Ranch policeman also often serve campsite for local travelers. In addition to enjoying the fresh air, walking through the trees, and soak in the hot water bath, you can also play flying fox in the woods. 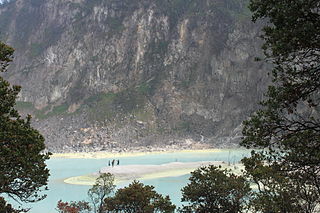 The coolness of the mountains will seem so travelers entering the resort that is located not far from the Tangkuban Perahu. There are some common wading pool and private hot water provided by the resort. Soaking in a mini pool make your body refreshing and healthy because water has a sulfur content inside. In addition, tourists can also take a dip in the small streams located around this place. In addition to the hot water bath, Sari Ater Hot Spring Resort is also equipped with a variety of challenging games such as go karts, ATVs, and Flying Fox. ATV rides at this place off road use trajectory path, the path that surrounds the Sari Ater is bordered by the township. Off road Challenge can also be crossed by the go-kart and a jeep. Flying Fox rides are also very stressful because of past fish ponds and birds roam. Some other rides are provided in the Sari Ater including outbound, mini golf, tea walk, go kart, off road jeep, horseback riding, indoor soccer, kart buggy, air soft gun, and paint ball. Katumiri located in the residential area. It provides a variety of games such as high ropes, flying fox, wall climbing, horseback riding, ATV up to the arena circuit that leads to a waterfall bride. Of the many games, play ATV is an activity that you must try when visiting Katumiri. Track ATV adventure will pass through vegetable gardens with an area of 10 acres. During the trip, you will pass through the swamp and climbs. You can race with friends. Once satisfied playing ATV, it was time to get cleaned up with a shower in a couple of waterfalls here. The trip to the waterfall bride usually about an hour relaxing trip. Travellers also will not feel tired because of the scenery in this place was very beautiful. With fresh and clean air, your body will became refreshed. Katumiri also provides various types of lodging with affordable prices. Accommodation is in the form of a wooden house on stilts or often called the gazebo. In addition to staying in huts, travelers can also camp at the camping ground. Katumiri was fit to be a tourist destination for family and friends. This crater is very beautiful. Stagnant water in the crater can change color. Turquoise-colored water can turn blue when the sky was clear. This place is often used as a pre-location filming and weeding because the exotic atmosphere. White crater area was a sulfur factory in the ancient times. Therefore, the smell of sulfur is very pronounced in the nose. After satisfied exploring the white crater, you can try an exciting adventure. Jungle Adventure is located near the bus parking area that offer tours in Ciwidey with using ATV. Tour route varies widely, ranging from a short tour as far as 2 km to tour the gardens surround the 6 km. tourists will be invited to traverse the ranch area policeman, white crater, strawberry fields and deer, to go back again if the white crater to participate strawberry tour. It provides an sightseeing tour also various sizes of ATV that can accommodate 3 people. This tour was very fun when referring friends and family.